The other night, there was a bat in our house. Not just any bat, but a Greater Horseshoe Bat. Roger identified it and our friend Richard, who is an ecologist and holds a license to handle bats, confirmed. There are 17 types of bat recorded in Britain and the Greater Horseshoe Bat is one of the rarest. 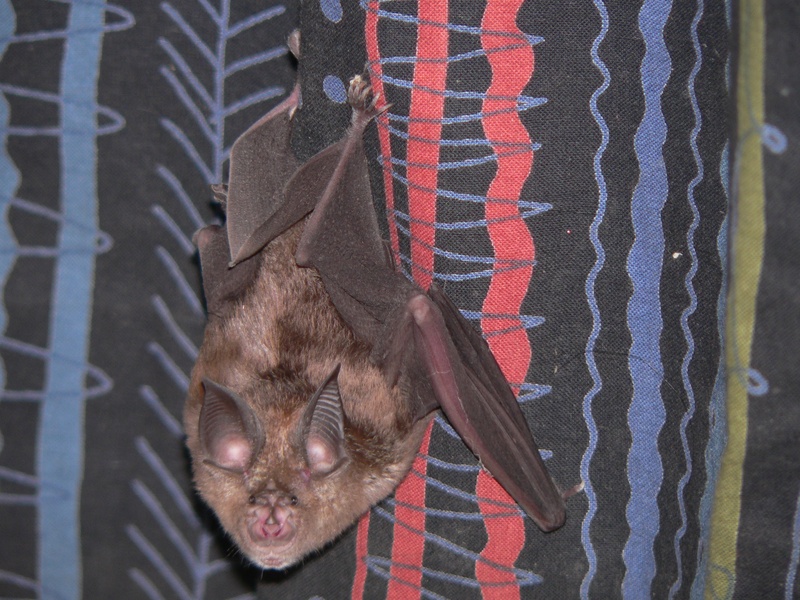 In 2001, there were 11 confirmed species of bat living in a variety of habitats within Dartmoor National Park, which is one of the largest breeding roosts in Western Europe for this type of bat. Bat roosts everywhere are suffering due to human activities such as modern farming methods, conversions of buildings, woodland mismanagement, the sealing of cave and mine entrances and the use of toxic chemicals and pesticides in the countryside. The mismanagement of hedgerows, or their loss altogether, can affect foraging for bats. Since 2004, Dartmoor National Park, along with other conservation groups, has worked to survey the bats and educate farmers about how to maintain bat friendly land and animal management. Bats aren’t the only things that fly about Crockern. Inside the house, we’ve also had a couple of birds, lots of moths, flies, and more than a few flying Daddy Long Legs. We’ve also heard, but not seen, a Cuckoo and a Tawny Owl. Bird watching is a popular activity for many walking up our path. We’ve met several “twitchers” and “birders”. There is a distinction. My friend Carolyn was very clear that twitchers are bird watchers whose goal is to collect sightings of rare birds and will drop what they are doing, drive to some destination to see said bird and add it to their life list. Birders, on the other hand, are those people who have a general interest and knowledge of birds and wildlife and like to watch birds. A casual bird watcher, like myself, may easily give myself away by saying something like “Wow, look at that bunch of ravens!” A twitcher is likely to give him/herself away with a snort and comment, “Don’t you mean that unkindness of ravens?” As far as I’m concerned, the dead giveaway of twitchers is that they are likely to refer to birds using only their Latin names and will comfortably use archaic linguistic groupings. One day it was pouring down with rain when I heard a knock at the door. There stood a man dressed head to toe in waterproof clothing and hanging around his neck were two sets of binoculars. “Oh, hi. I was just wondering if you’ve heard a unique sound in the meadow?” he asked. An odd greeting. Nonetheless, I knew the sound as Roger had pointed it out to me just a few days before. Unfortunately, my recall was a bit off and when attempting to sound knowledgeable about the Grasshopper Warbler, I said, “Oh yes, that would be the Cricket Shaker.” I did not impress this twitcher with my bird watching ways. He gave me a look that suggested I had just said, “Why look at that flock of crows!” I accept that I will never become a serious birder, but I am motivated to try and commit more to memory. I may not go so far as to use all of these in sentences, but if nothing else, I think I can at least manage to use the obsolete “Dissimulation of Birds,” rather than the more easily understood “Flock of Birds” next time I have the opportunity. It’s true; I have become a bird watcher. Each morning I will sit looking out the window at the birds at the feeders while I drink my coffee. I can spend an enormous amount of time thinking my thoughts while watching the arrival and departure patterns at the feeder. Regularly, there is the little Chaffinch who has a missing leg, and the two Great Spotted Woodpeckers who like to hunt insects in the rotten post at the fence. Now that summer seems finally to have arrived in the middle of September, the bugs outdoors are in full force. Midges being among the many. According to the dictionary on my computer, a midge is “a small two-winged fly that is often seen in swarms near water or marshy areas where it breeds. The families Chrionomidae (the nonbiting midges) and Ceratopogonidae (see biting midge). “ I need look no further than the red marks on my arms, we have the biting midge. Not as aggressive as the ones found in Scotland, but they are tenacious and determined and, if the air is still, out in full force to feed on us. Also feeding in full force are the Swallows and House Martins, who dive-bomb about on an insect binge! As they fill the sky in aerial pursuit of their bug meal, it is not a hard stretch to imagine the skies during the Battle of Britain, with Spitfires and Lancaster Bombers defending the southern coast. It is no surprise, that they are known as a Flight of Swallows. We also have general houseflies, butterflies (Brimstone, Small and Large Whites, Small Tortoiseshell, and Small Heath), the occasional bee, and one day an Elephant Hawk Moth resting on a towel on the line. 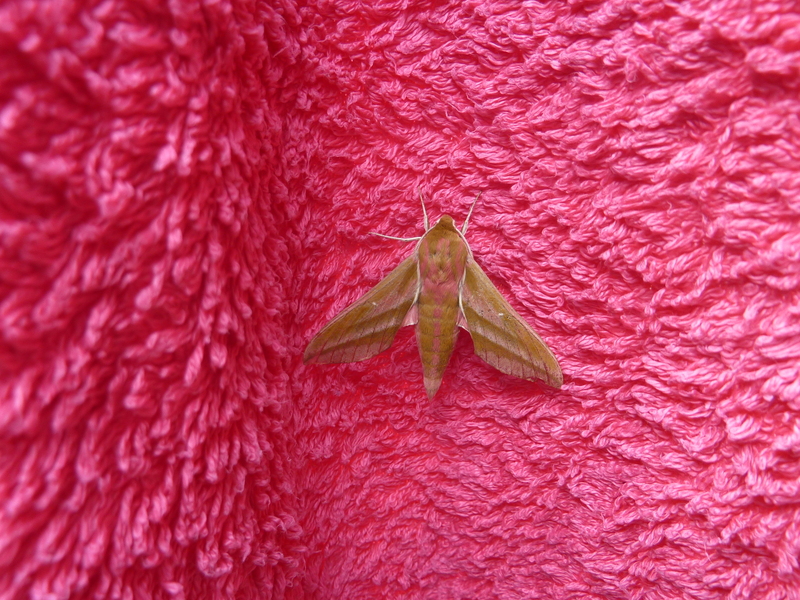 It may have been using the bright pink towel as camouflage. This is the first time I’ve seen this beautiful moth up close. I’ve seen the caterpillar stage, and still have a few nightmares about it. If interested, one can easily find a home video on YouTube and watch how its proboscis nose moves in and out. Impressive, but honestly, I didn’t have the stomach to try to film when I saw one of these in our garden. I went inside and left it to its prehistoric moves. Last week we were putting the finishing touches on our raised vegetable beds, which involved moving a ton of veggie compost from the top of the track down to the beds using a wheelbarrow, buckets and our determination. We were just finishing when we heard a thunderous roar followed by the visual spectacle of nine Red Arrows flying past in strict formation. The Red Arrows is the aerobatic team of the Royal Air Force who promote and recruit for the RAF as they do many fly-pasts at major events. Such events include the opening ceremony of the 2012 London Olympics and the lesser-known completion celebration of our raised vegetable beds. There is an MOD training area just over the hill so we often see military planes. Occasionally, we will see the Dartmoor Rescue helicopters looking for some lost or injured hiker on the moors. Since walkers are permitted to wander all over the moors, it is not uncommon for some to get lost, especially if the fog or mist moves in, sometimes making it difficult to orient yourself beyond a mere three feet. We once spotted paragliders floating above the hill, and almost every day, there are anglers wading in the river using their fly rods to try and catch brown trout. But, let us return to the twitcher who knocked on our door. A few weeks later, he came knocking again. This time, he had a friend with him and the two were hoping to see a Redstart as the one man had never seen one. While listening to this conversation — I had opted for eaves dropping rather than answering the door — I found myself feeling righteous because the day before I spotted a Redstart sitting on our wall. Roger identified it for me but all the same, I saw it. Sometimes it just pays not to make so much effort. I like this bit by Virgil. Why do I need to move quickly to accomplish something? Instead, can’t I just drift off into my thoughts, sometimes without much to show for it, except for the details I maintain? That delightful moment on a walk, or the beauty of the light changing as the clouds drift past, are the memorable features I retain no matter how much time passes. Each time I stop to look and listen, I discover something new. There are of course, the Parliament of Rooks, Murder of Crows, or in our case, the Trio (okay, Brood) of Chickens. They have names now: Judy, Mabel and Fey.